How can we know where we’re going if we don’t know where we’ve come from? This photo of my grandma is my time machine. I was born in a tiny country called Slovenia. I’m visiting my hometown this week and exploring my family history, collecting old photos, talking to old relatives, visiting archives and building my family tree. For at least 200 years my mother’s family has lived in a tiny village just outside the city of Maribor. 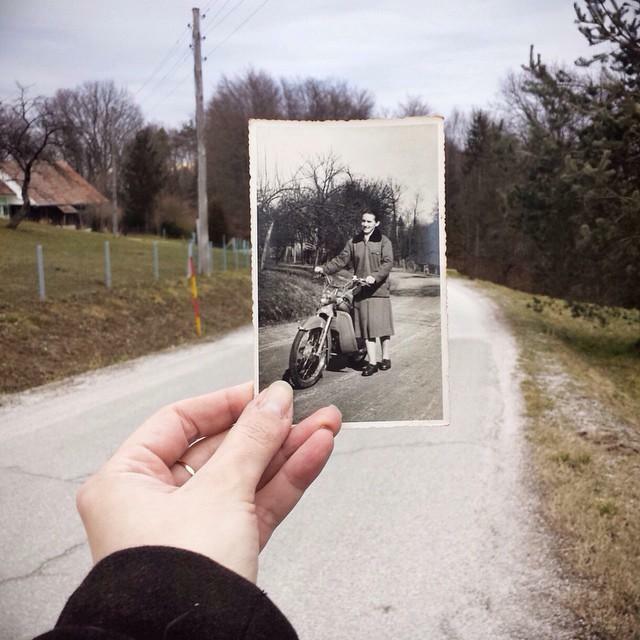 My grandma was born in 1934 and grew up during the difficult years during and after WW2. Most people there were farmers. Many had just enough produce to feed their families and the fortunate few who had more walked to Maribor, which is about 12 km away, to sell veggies at the market. The even more fortunate ones had a bicycle and didn’t have to walk! So you can imagine the excitement when people could afford motorbikes around 1960. My grandma’s brother was the first in the village to have one. Even though my grandma never got her drivers license, she tried to ride this motorbike. Fifty years later, she still tells this story every time she sees this photo.